A figure from this study. Featured Paper of the Month – Novermber 2018. Root and Zhang et al. (from Dr. Morales’ lab) identified throughout the brain concentrated populations of glutamate and GABA co-transmitting neurons in ventral tegmental area, entopeduncular, and supramammillary nuclei. Single axon terminals from these neurons form a common synaptic architecture that co-transmit glutamate and GABA from distinct synaptic vesicles at independent asymmetric or symmetric synapses. Cell Rep, 23 (12), pp. 3465–3479, 2018, ISSN: 2211-1247 (Electronic). 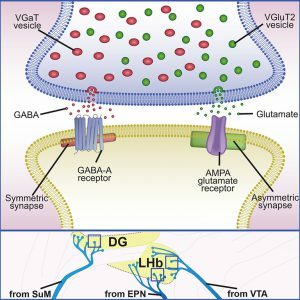 For decades, it has been thought that glutamate and GABA are released by distinct neurons. However, some mouse neurons innervating the lateral habenula (LHb) co-release glutamate and GABA. Here, we mapped the distribution of neurons throughout the rat brain that co-express vesicular transporters for the accumulation of glutamate (VGluT2) or GABA (VGaT) and for GABA synthesis (GAD). We found concentrated groups of neurons that co-express VGluT2, VGaT, and GAD mRNAs within subdivisions of the ventral tegmental area (VTA), entopeduncular (EPN), and supramammillary (SUM) nuclei. Single axon terminals established by VTA, EPN, or SUM neurons form a common synaptic architecture involving asymmetric (putative excitatory) and symmetric (putative inhibitory) synapses. 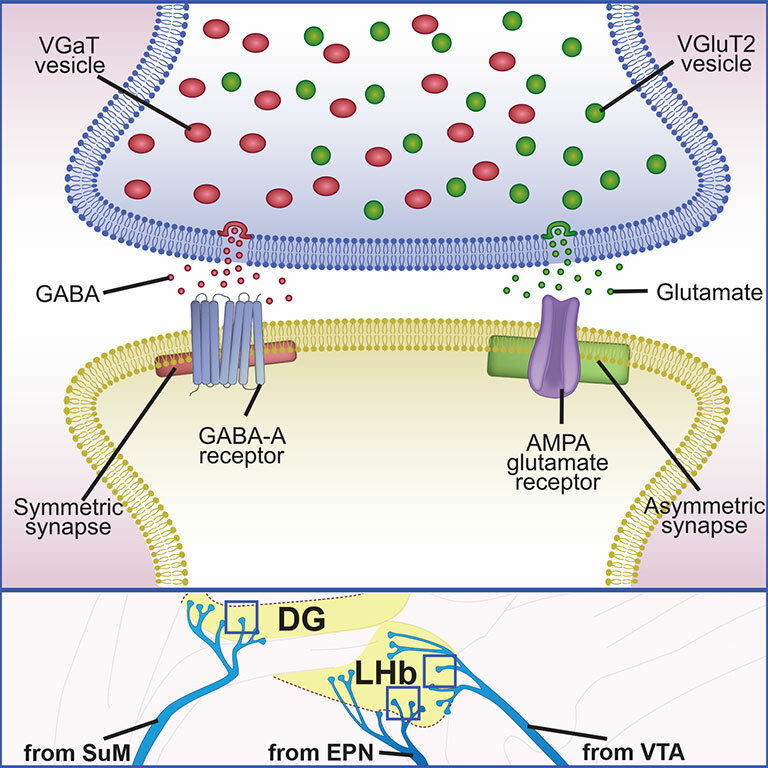 Within the LHb, which receives co-transmitted glutamate and GABA from VTA and EPN, VGluT2 and VGaT are distributed on separate synaptic vesicles. We conclude that single axon terminals from VGluT2 and VGaT co-expressing neurons co-transmit glutamate and GABA from distinct synaptic vesicles at independent synapses.